God, is this really true? Did we really do the wrong thing? Should we have handled it differently? What should we do about all of it now? The more I pursued God, the more peace I felt as I remembered that He was in control and would bring clarity to the situation. 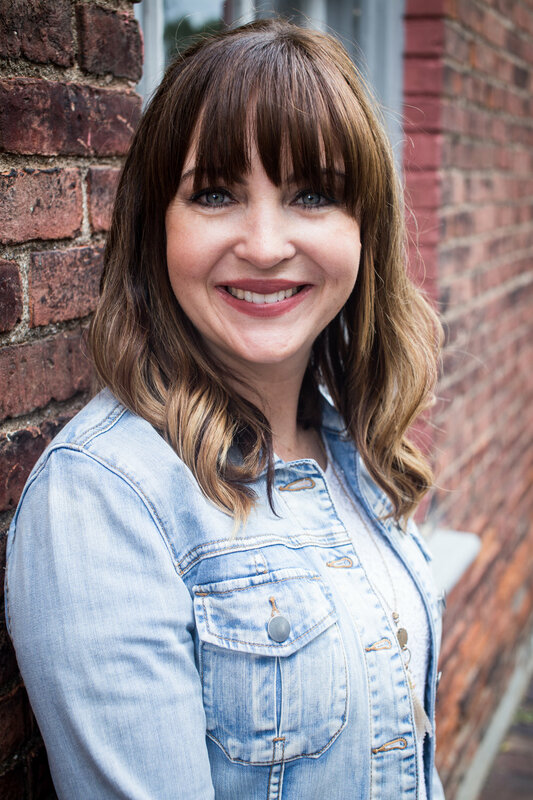 By the time I was finally able to approach the subject with my daughter, after talking with my husband, I was calm enough to be able to approach it with my "mommy" life coaching hat on — a.k.a., asking questions without delivering unfounded accusations. As we uncovered the details, we discovered that it was a matter of twisted words, which quickly pointed to real problem — the enemy of God. Oh yes, the Father of Lies was at it again, seeking to steal, kill, and destroy me and my family (John 8:44, 10:10), using unfounded guilt to get the best of us. When guilt feels like condemnation, it’s likely being put on us by the enemy. Those guilty feelings we all face are either a result of condemnation spewed on us by the enemy or godly conviction that comes from the Holy Spirit who desires to lead us into right living (Romans 8:1, John 14:26, John 16:7-8 NLT). Conviction is the Lord’s way of gently and purposefully showing us what needs to change in our hearts and habits in order to glorify Him. But how do we know the difference between guilt that is a result of condemnation rather conviction in the heat of the moment, especially if our emotions dominate our thinking faster than our ability to embrace the truth? That’s where time, prayer, the Word, and other believers become incredibly valuable. Rather than reacting to the guilt we feel, we need to respond to it in light of the Truth. We need to ask honest questions of ourselves as we seek God for biblical clarity on our circumstances, and if we’re still unsure if it is condemnation or conviction, we need to seek godly counsel for another perspective. Guilt can be the gateway toward transformation when it’s a Spirit-led conviction. The fact is, moms, that we will make mistakes. We are guilty because we are sinners (Romans 3:23). We will fail and be foolish at times. We’ll forsake opportunities and forget the details that really do matter. We’ll never be enough and we’ll never by “all that” because in our flesh we are weak and worrisome sinners. We are guilty. But we can find hope in knowing that we belong to an all-sufficient God who takes our guilt from us through Jesus Christ, who paid for it once and for all on the cross. God takes our guilt and gives us in return His forgiveness for our sins as He covers our mess with His all-sufficient grace (Ephesians 1:7-8 NIV). In Christ alone, we will find the freedom from guilt and the power to press onward. So, isn't it time you let those guilty feelings go in exchange for embrace holy conviction that leads to real transformation? 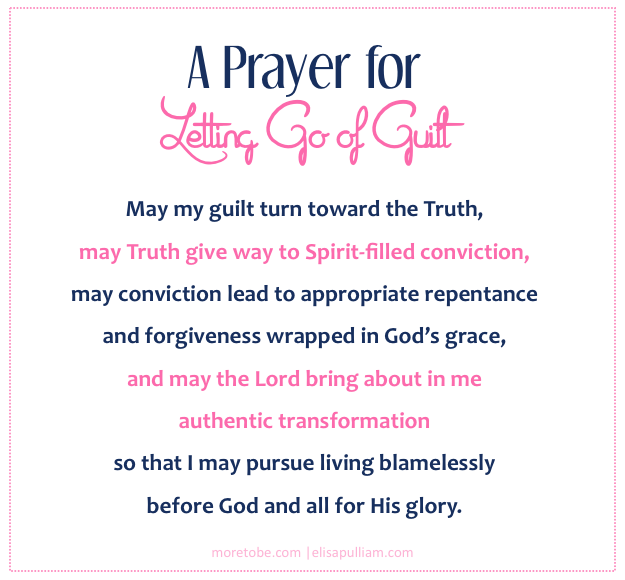 May my guilt turn toward the Truth,may Truth give way to Spirit-filled conviction,may conviction lead to appropriate repentance and forgiveness wrapped in God’s grace,and may the Lord bring about in meauthentic transformationso that I may pursue living blamelesslybefore God and all for His glory. If this is a topic you need to go deeper on, grab the FREE download of Letting Go of Mommy Guilt Devotional Study at More to Be. There is a version for moms plus one for tween and teen girls, because, let’s face it — guilt starts young. You might also want to listen in on a message delivered to a MOPS group, which inspired this topic here.